Asus ZenFone Go TV is all about watching digital TV at any time and anywhere. It has a built-in SONY IC (SMT-EW100) chipset Digital TV (DTV) tuner, that enables you to watch your favorite digital channels in high definition everywhere you go and especially in Nigeria. Just switch on, tune in and sit back — no internet connection required! 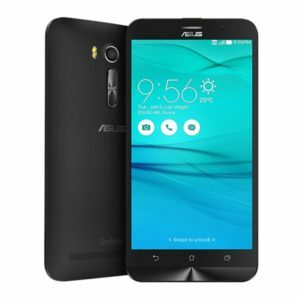 The Asus Zenfone Go TV features a 5.5-inch HD IPS capacity touchscreen which qualifies it has a phablet. The touch capacitive screen has a resolution of 1280 x 720 pixels which ensures an enjoyable viewing experience. The screen is protected by the famous Corning Gorilla Glass 3 while incorporating a physical rear key as part of the new ergonomic arc design. It is available in eight colors which include Charcoal Black, Pearl White, Lake Blue, Glacier Gray, Sheer Gold, Glamour Red, Floral Pink and Silver Blue color variants. The handset measures 151 x 76.9 x 10.7 mm and weighs 160 grams. The Asus Zenfone Go TV is powered by a 1.4 GHz quad-core Qualcomm Snapdragon 400 (MSM8928) processor and 2GB of RAM. There are 16GB and 32GB of internal storage in this device to which you can add 64GB more via a micro SD card. The smartphone runs on Android 5.1 Lollipop operating system with Zen UI on top of it. It is available in 16GB and 32GB of internal storage with an option to add 64GB extra memory via a micro SD card. The smartphone runs on Android 5.1 Lollipop operating system with Zen UI on top of it. This handset has a 3010 mAh lithium-ion battery which claims to offer up to 335 hours of standby time. This is pretty decent and just enough to power the TV feature. As would be expected, the device has dual SIM card slots. It also offers 4G connectivity with download speeds of up to 48 Mbps. The Asus Zenfone Go TV has a 13-megapixel rear camera with dual tone LED Flash and a 5-megapixel front facing camera. The price of Asus Zenfone Go TV in Nigeria ranges from N30, 000 to N60, 000 depending on where and when you purchase the smartphone. You can purchase the smartphone from leading online stores in Nigeria. Follow the links below to get the best deals.